Global O-Ring and Seal offers a wide variety of products which are FDA-compliant. What does it mean for a rubber o-ring to be FDA-compliant? Dry Foods: Must meet formulation and curation criteria under conditions of good manufacturing practice as appropriate for repeated use. Liquids: Must meet extraction criteria (not exceeding 20mg/sq inch in distilled water). Fatty Foods: Must meet additional extraction criteria (not exceeding 175mg/sq inch in n-hexane). 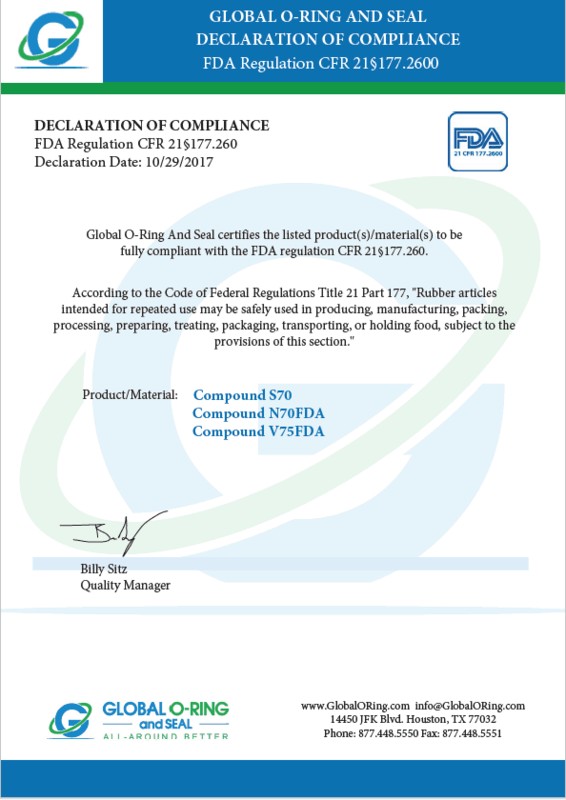 Global O-Ring and Seal achieves FDA compliance standards, and our FDA Declaration of Compliance can be viewed here. Utilizing FDA-compliant o-rings is the best way to keep food safe and ensure biological products adhere to federal standards of sanitation. We can offer many more, so please fill out the form on this page or call us with any special FDA-compliant product requests. We also offer a wide selection of FDA materials in o-ring cord to make FDA compliant spliced and vulcanized o-rings. Note: The Food & Drug Administration does not individually approve specific products to CFR 21.177.2600. The manufacturer of the completed FDA-grade product is the designated entity to furnish an FDA certificate as evidence of its compliance. Furthermore, while a manufactured part may be FDA-grade material, one should not infer that part fits its intended technical application.